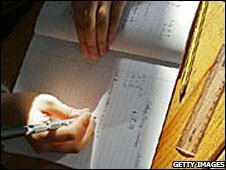 School mathematics exams in England have become easier, shallower and less demanding, according to a think tank. Analysis of public maths exam papers taken by 16-year-olds between 1951 and 2006 shows standards have declined markedly, the report for Reform argues. This means more pupils have left school ill-prepared for the workplace and a generation of mathematicians has been lost to the nation's economy, it adds. The government insists maths exam standards are very closely monitored. The Reform report assesses how maths exam papers changed over time in terms of their content, difficulty, style and pass standard. It concludes that between 1951, when O-levels were introduced, and 1970, standards remained constant with a strong focus on algebra, arithmetic and geometry. A simplification trend began in the 1980s with an attempt to show mathematics in context, but the syllabus remained comparable to that of earlier years. But there was a steep decline in standards from 1990 onwards, once GCSEs were introduced, it says. The content became broader and shallower, with a more restricted and less demanding syllabus, it claims. And the difficulty and demand of questions weakened along with their style, it claims, with candidates being required to follow a series of steps rather than work their own way through. Calculators were also allowed in some papers and formulae sheets were included in papers. Added to that, the percentage mark required for a grade C fell to about 20% in the higher tier GCSE in 2000 and 2006. The report claims that the apparent rise in attainment over the 1990s and 2000s is "highly misleading". "Exams have changed from being a staging-post to further study to being a series of 'tick-boxes'," it adds. This has led to mathematics at university being compromised and able-students being neglected, and has cost the economy billions of pounds in lost mathematicians. Deputy director of Reform and a co-author of the report Elizabeth Truss said: "In today's Britain it is acceptable to say that you can't do maths, whereas people would be ashamed to admit they couldn't read. "We need a cultural revolution to transform maths from geek to chic." Schools Minister Jim Knight said standards were carefully monitored by an independent watchdog to make sure they remained world-class and were an appropriate preparation for study or work. He added that more students were taking maths and further maths at A and AS-level. "Ucas figures show the number of people who took up places on full time maths degrees has gone up by 9.3% on last year. "That is good news, but we agree maths is of vital importance to the economy and it is a top government priority to encourage more mathematicians in the future. "In addition, we have launched a campaign to encourage more young people to consider careers in maths and science," he said. Shadow children's secretary Michael Gove said the report underlined the importance of mathematics in driving economic growth. Its stress on the need to nurture the mathematics economy was timely and important, he said. "India and China are producing four million graduates every year. The single largest area of graduate growth is mathematics, science and engineering. "A third of graduates in China are engineers - here it's just 8%. Between 1994 and 2004, more than 30% of the physics departments in Britain disappeared." Liberal Democrat schools spokesman David Laws said: "This is a damning critique of maths education in this country. "Our education system is too often failing to get the basics right, which risks damaging the national economy."